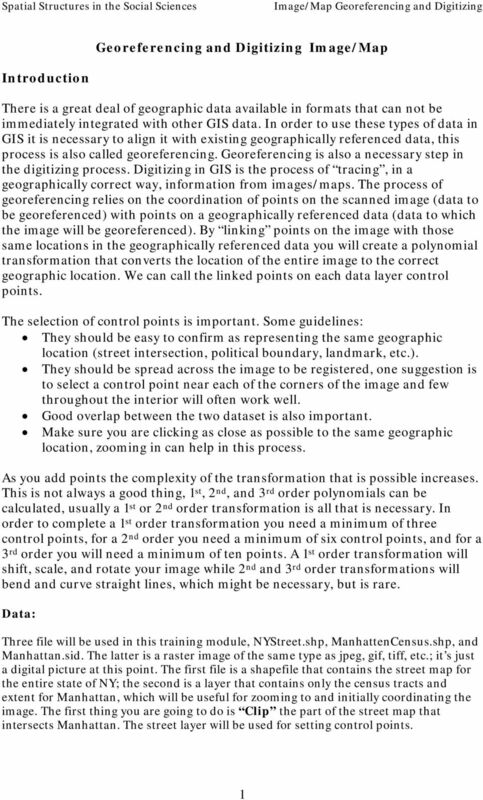 Download "Georeferencing and Digitizing Image/Map"
Georeferencing Imagery in ArcGIS 10.2.x Georeferencing is the process of aligning imagery (maps, air photos, etc.) with spatial data such as point, lines or polygons (for example, roads and water bodies). Government 1008: Introduction to Geographic Information Systems. LAB EXERCISE 4: Got Database? 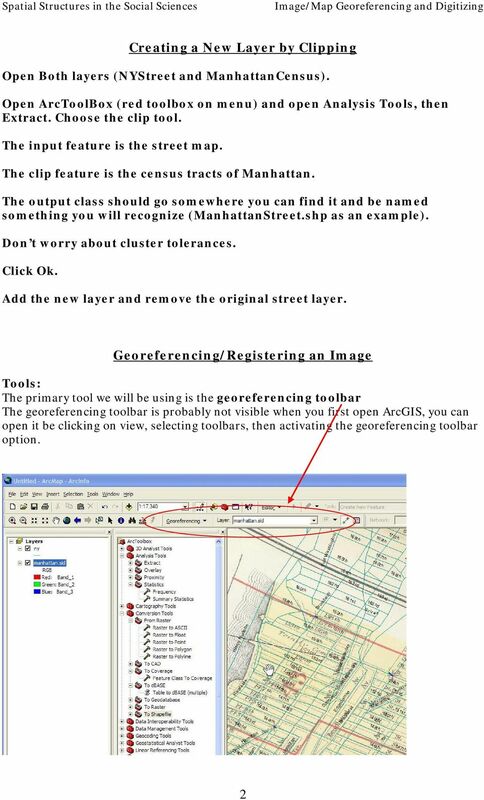 Georeferencing images and scanned maps In this exercise, we can see how to add georeferencing to scanned maps and aerial photos so that their value can be multiplied through association with other data. Spatial Analysis Tip Sheet Spatial Joins and Overlays, Density, and Proximity Analysis Barbara Parmenter Tufts University October/Nov. 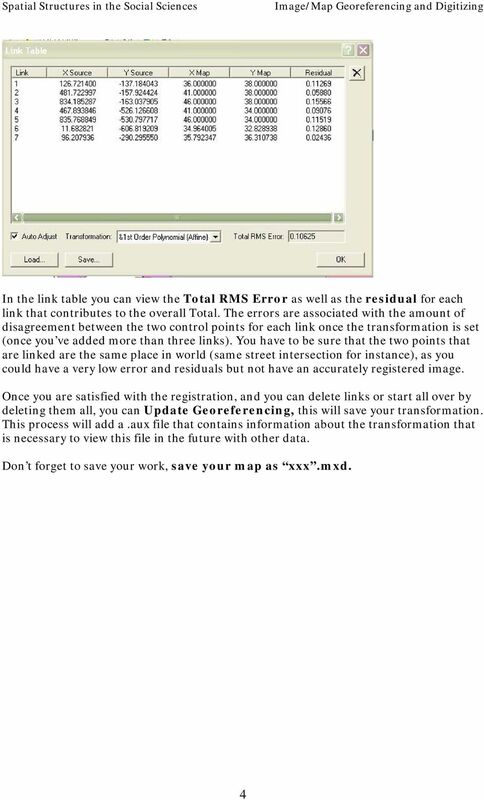 Vector Data Analysis I: Buffering Today we will use ArcMap and ArcToolbox to manipulate vector-based geographic data. The results of these simple analyses will allow us to visualize complex spatial relationships. 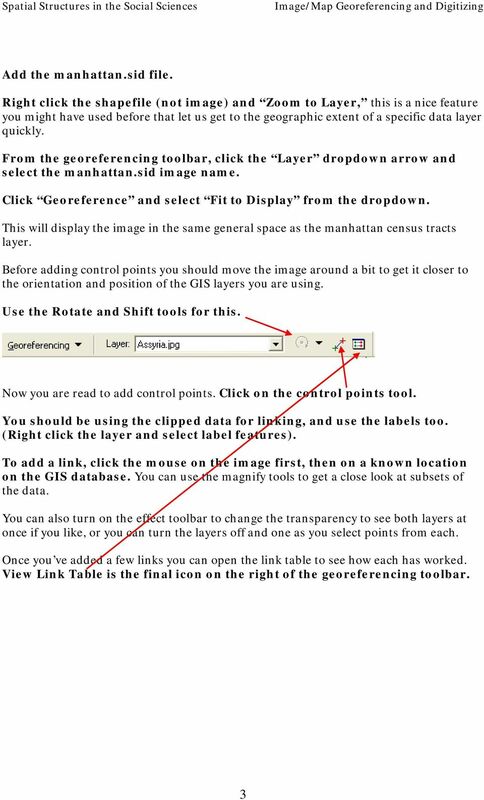 Lab 4: Image Georeferencing What You ll Learn: This Lab introduces image georeferencing, also known as image registration or image transformation. 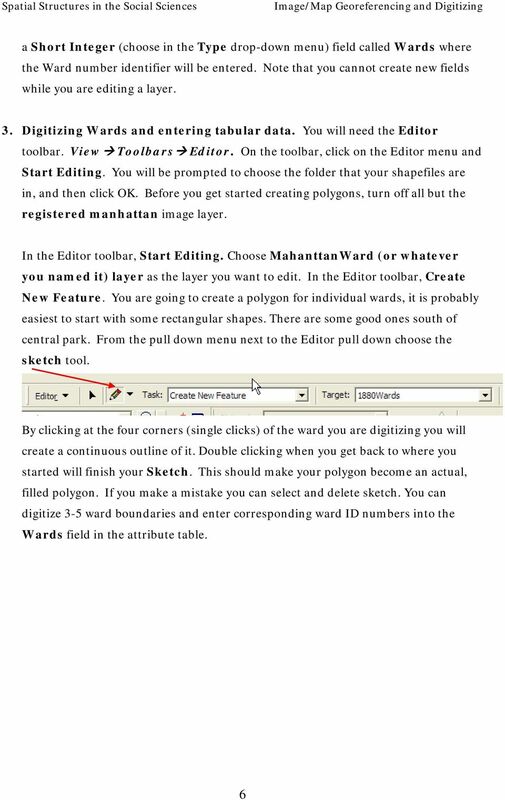 We ll then update a data layers through vector digitizing. The Scenario You have been hired as a GIS consultant with the county school board. They need to get a better idea of where school age children live and where they should consider building additional schools. Perhaps the fastest way to get information about a single feature is to identify it, using the Identify Tool. 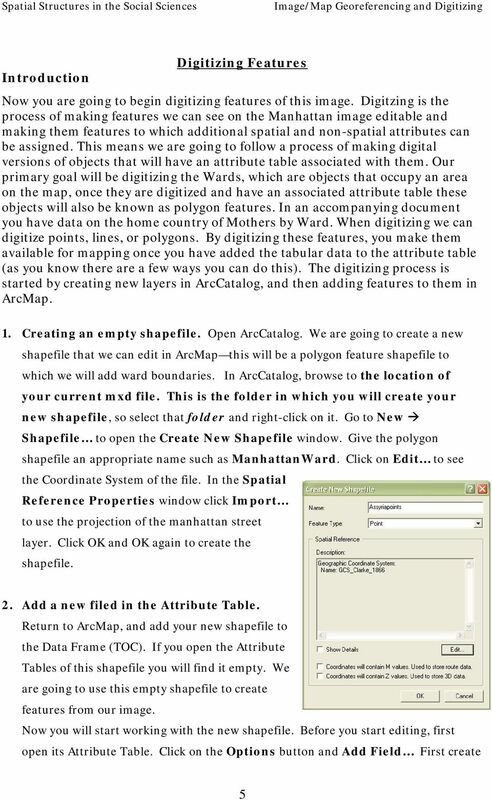 ArcScan Tutorial. 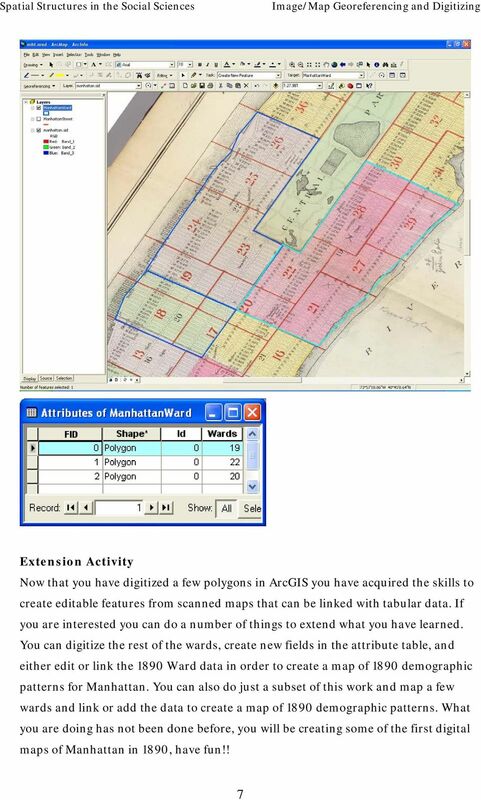 Copyright 1995-2012 Esri All rights reserved.